The construction of the long awaited Bernalillo County Animal Care and Resource Center can now begin after today’s groundbreaking ceremony, which took place at the building site - 3001 Second St. SW. This new animal care and resource center will be a 17,143 square foot facility and will include space for approximately 120 dogs and approximately 67 cats and there will be additional space for large animals, small mammals, birds, and reptiles. The county will also offer new programs and services to engage the public in the care of animals, promote responsible pet ownership and provide resources to assist people and their animal companions. 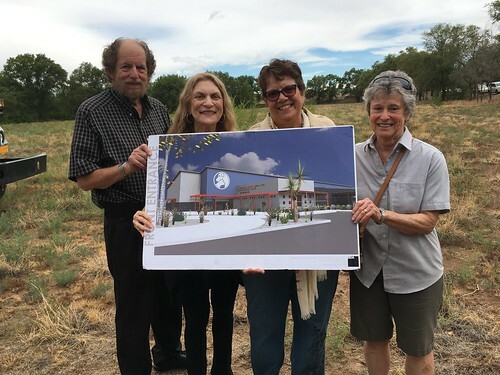 “We look forward to providing a space for the community to learn and network, enjoy positive experiences with various types of animals and engage with animal care professionals,” says Misha Goodman, BernCo Animal Care Services Department director. The total cost of the project is $7.8 million. Voters approved funding for this project utilizing public safety general obligation bonds from 2012-2017. Construction is expected to be completed by late summer 2018. The county’s current animal care shelter is housed in an old county fire station and has served county staff well for a number of years but it was never designed or intended to house animals. In emergency situations, the county has been able to shelter animals there, but only for short periods of time. Additionally, BernCo contracts with the City of Albuquerque and out-of-town animal shelters to house its animals. To view a slideshow of the groundbreaking ceremony, click on the image below.